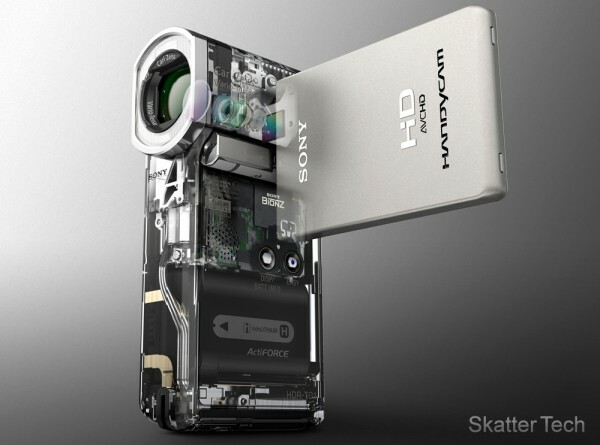 Yesterday Sony announced the smallest full-HD camcorder for consumers. The device is only 1.3-inches wide, 4.7-inches tall, and 2.5-inches deep but has the capacity to record 1920 x 1080 HD video content and capture 4.0 mega-pixel photos. Instead of recording to a miniDV tape, all content is recorded onto the Sony Memory Stick PRO Duo cards. And Sony even includes a 4GB Mark2 card along with the camcorder so you can start recording immediately. The camcorder also features an innovative 2.7-inch touch panel LCD screen. The camcorder is also loaded with plenty of Sony’s automation technology to recognize faces, focus, and adjust to the environment. Although this may irritate professionals, it will however satisfy the consumers it was intended for. The audio is also captured in 5.1-channel Dolby Digital surround sound which will provide top notch audio quality to complement the HD video. The compact HDR-TG1 HD camcorder will become available next month (May 2008). The current manufacturer’s suggested retail price is set at $900. When it becomes available it can be purchased on SonyStyle.com. in Sony Retail Stores, or through authorized dealers. Pre-orders begin on April 4th. is it 1080p? or like the 720p or something? yes, “1920 x 1080” is 1080p resolution. I hate your site! But this is a great article. Please check out my site. I hate you Sahas Katta!